The Alderleaf Wilderness Certification Program spent a wonderful week tracking and working on winter survival skills in the Okanagon region of eastern Washington. Students got to track a variety of wildlife through the snowy landscape of Ponderosa pine forests, meadows and aspen groves. Some groups traveled through the valley, while others climbed the ridges. 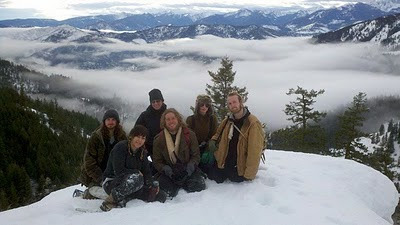 Each becoming familiar with the plants and animals of the eastern cascade mountain region. 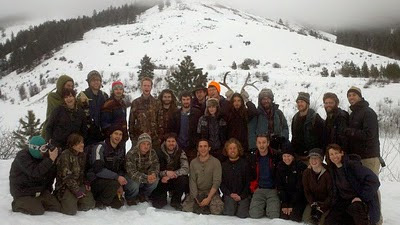 Some of the highlights included: most of the class getting to watch a white long-tailed weasel repeatedly hunting voles through the snow near are main camp, finding tracks of many creatures including pine marten, snowshoe hare, grouse, and cougar, and hearing a chorus of coyotes echoing through the night air. 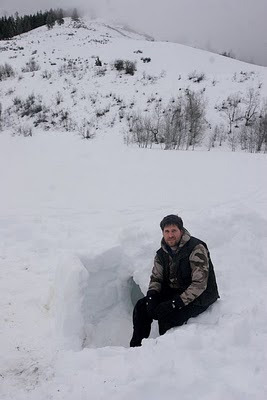 Students built a variety of snow shelters, including quinzees and snow trench shelters. Such shelters can be surprisingly warm when properly made and are key to surviving the extremely low temperatures of winters. Students constructed them, and slept in them for the week. Here Alderleaf instructor Dave Scott demonstrates a snow trench shelter, created with an additional wind block wall near the door to help reduce wind chill. The entrance to the shelter can be seen next to Dave's right leg. The trip was a great success, with many amazing experiences and memories made. The Alderleaf crew left the Okanagon with deep gratitude for all the gifts we received and we look forward to another trip out next winter!